Glitched trophies: Almost all of the trophies have been reported to not pop when they should but they will eventually. The game occasionally crashes too, which may affect trophies. RANCHER needs some special help, see trophy for more info. 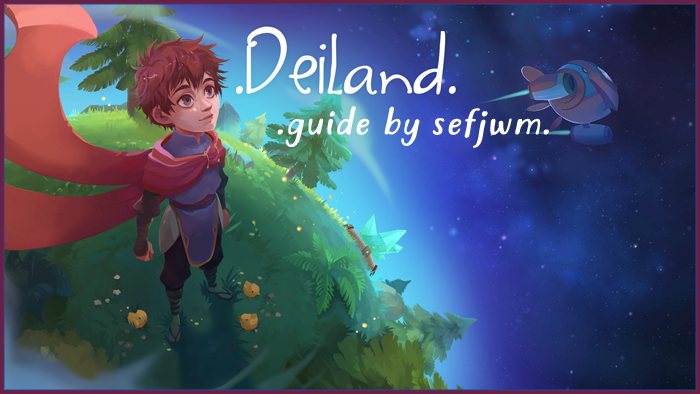 Deiland is a neat little farming sim where you can grow crops, mine and fight monsters. Multiple alien visitors will come and go with things to sell, recipes to make and errands to run. Along the way you'll collect story pages that help explain who you are and what your destined to accomplish. Everything in this game will either come naturally or through a little grinding post game. It's not a long game so just play it and enjoy it. Try to always be growing crops, killing mobs and mining when you can as this will help reduce the already short grind later. You have been awarded the PRINCE trophy. You have been awarded the FARMER trophy. You get this after harvesting 15 crops. This will happen naturally as you play through the game. You have been awarded the MASTER FARMER trophy. You get this after harvesting 100 crops. You will most likely get this naturally as you play through the game. Just keep growing and harvesting. You will need things like wheat and sunflowers for MASTER CHEF. Using water and rain will help speed up crop growth. You have been awarded the MINER trophy. As you progress the story you will be given plans to build a mine. Inside the mine are a bunch of crystals. You get this trophy for mining all the crystals. Sometimes this pops early sometimes late. Just keep mining. You have been awarded the FISHER trophy. You get this for catching 20 fish. You have been awarded the GREAT FISHER trophy. You get this for catching 50 fish. Early on you will get a recipe for crafting a fishing pole. Once you make this you can use larvae to fish in the pond. The fishing mini game is simple, you just have to hit the correct button while the meter is over the blue part of the bar. If you are struggling just pick one button and wait until that button appears ( and seem to be the most common). You can get larvae from bug enemies, Brram and Umi. You have been awarded the WOODCUTTER trophy. You get this for harvesting 50 trees or bushes. You will need a good amount of wood throughout the game so this should come naturally. You have been awarded the GARDENER trophy. You get this for harvesting 30 flowers. You have been awarded the MASTER GARDENER trophy. You get this for harvesting 90 flowers. Eventually there will be a meteor that drops a mysterious seed. Plant the seed and then push the plant that results. This summons Lily who will teach you to make flower pots where you can grow flowers. Lily, Yuki, Locke and Hute all sell flower seeds. Unlike crops and trees, flowers are not self-replenishing and you will need to buy more seeds. You have been awarded the BLACKSMITH trophy. You get this for crafting 15 items in the workshop. You have been awarded the MASTER BLACKSMITH trophy. You get this for crafting 30 items in the workshop. You may get this naturally through normal play. If you need more, the glass bottles are the easiest to craft (1 crystal each) and can be used to craft potions for MASTER ALCHEMIST. You have been awarded the COOK trophy. You get this for cooking 15 items in the kitchen. You have been awarded the CHEF trophy. You get this for cooking 40 items in the kitchen. You have been awarded the MASTER CHEF trophy. You get this for cooking 100 items in the kitchen. You most likely won't get this naturally. The easiest way to grind this out is to make oil, which can then be used to bake bread, and then made into sandwiches. You have been awarded the ALCHEMIST trophy. You get this for brewing 10 items in the laboratory. You have been awarded the MASTER ALCHEMIST trophy. You get this for brewing 40 items in the laboratory. You will most likely not have this by the end of the game. The easiest thing to brew are health potions which can then be turned into jelly. You have been awarded the BUILDER trophy. You get this for building 30 structures. The easiest thing to build are fences and they count towards this trophy. You have been awarded the EXPLORER trophy. Around mid game Mun will take you to another planet called Ankora. You will get this trophy as soon as you land. You have been awarded the TAMER trophy. You get this for defeating 30 monsters. You have been awarded the HUNTER trophy. You get this for defeating 80 monsters. You have been awarded the MASTER HUNTER trophy. You get this for defeating 150 monsters. It seems like a lot, but this will come naturally as long as you don't use the prayer of protection (it prevents normal monster spawns). The monsters are really easy to kill and also have drops needed to craft things for other trophies. Kill them any time they show up on Deiland and if you need more just go to Ankora where there are always monsters. You have been awarded the MERCHANT trophy. Brram has a quest requiring 5 crab legs. You can get these from crablike monsters that may randomly spawn on Deiland. This trophy will pop when completing that quest. You have been awarded the WHITE WIZARD trophy. Nidawi, near the Ankora temple, will give you a recipe to make a white cloak. Once you make the white cloak, talk to Mun to pop this trophy. You have been awarded the RANCHER trophy. Bugged! Many people have reported this trophy to be bugged. According to the devs it's supposed to pop when you have 4 sheep in your barn. If it doesn't pop try going back to Ankora and buying more sheep from Umi (this is how I fixed it). You can also try not feeding the sheep so they escape and then re-capture them. Others have reported changing the language options in the game helps. Good guide Sef, very enjoyable game. To lessen the grind at end stock up on blueberries and cherries for alchemy. Can confirm had to buy an additional 5th sheep to get trophy. Thanks. I was tempted to explain some of the weirder quests but there were only a couple (giant pumpkin and summoning Lily) and the Lily one I explained already so I didn't make a section for random stuff like that. Hey sef, great work on the guide but there is no way this is a 5 hour plat. I have been playing for 2 hours at least and I have only just unlocked one trophy. I'd say a better estimate is 10-15 or possibly longer. Quickest time on EU ver is 14 and a half hours and quickest on the NA is 12 hours. Ok thanks. You're not the first one to mention this. I'll update it. Sorry for being so far off XD. Lol, I was waiting for a query on the time.